Last night I went to an amazing workshop on authenticity run by the simply brilliant Emeli Paulo from Collective Potential. If you’ve never heard of Collective Potential do yourself a favour and check them out. At the start of the workshop we were asked to turn to a stranger and tell them what brought us to the workshop. For me I had started to feel like the authenticity that I had once lived my life with was beginning to fade and I wanted to turn that around. I have to admit I was kind of expecting to be lectured about what authenticity is and given steps to living an authentic life. I was so glad that it was nothing like that. It was super interactive and required everyone to talk about their truth; to share their values, their fears, their dreams, their story. It was simply stunning to see how contagious bravery can be. One person gets up and says or does something inspiring and next thing you know some on the other side of the room has something to contribute too. The most magical part of the night for me came near the end when I found my truth in someone else’s story. A lady was sharing with the group that she felt like she needed to let go of grief for the loss of her mother. As she spoke I realised how much I had not let myself grieve for the loss of my father. It had been a month since I’d lost my father unexpectedly and I could count on one hand the amount of times I’ve let myself really cry. For decades to me strong has meant putting on a brave face and getting on with things. It has only been in the last year or so that I’ve begun to see the strength in vulnerability. Not giving myself the time and space to sit with my pain and feel what I need to feel was a big part of why I felt like I wasn’t living a very authentic life. An idea that really resonated with me about authenticity is that it is about being real not perfect. So how do I get myself to be more real…I knew the answer before I even asked the question. I knew I needed to be kinder to myself, I knew needed to stop expecting so much from myself and I knew I needed to nurture the most important relationship I have, the one I have with myself. At the end of the workshop we were asked to set ourselves a challenge for the next 30 days. It was to be something that we could do each day that would allow us to become more authentic. Straight away I knew that I wanted to set myself a 30 day kindness challenge. To each day do one kind thing for myself. 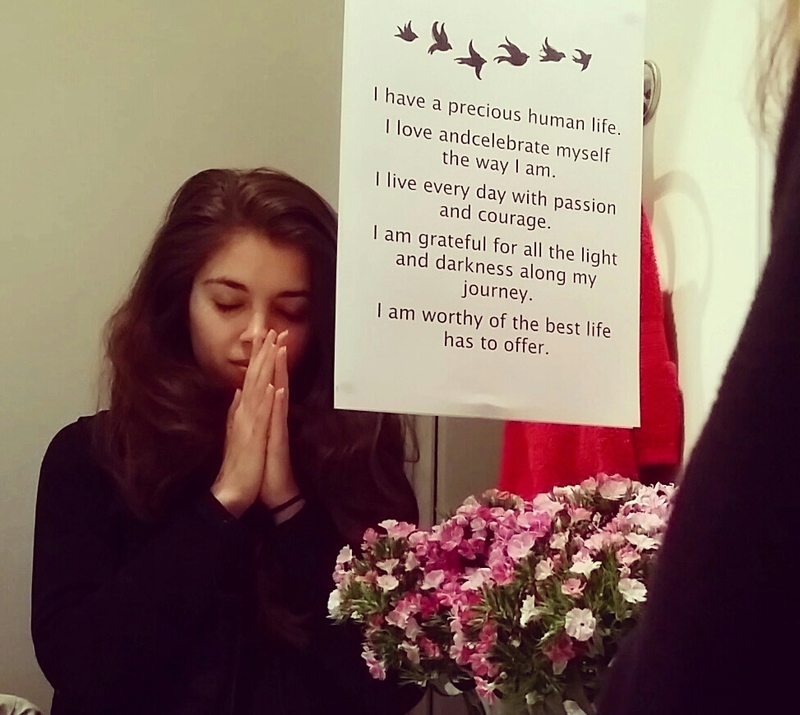 I’m starting today by putting an affirmation on the mirror that I stand in front of each day when I brush my teeth. You can follow my 30 days of kindness on my instagram @ckve and use the hash tag #30daysofkindness to share your own little bits of kindness that you give yourself. At the end of my 30 days I’ll post a list of the things that I do for myself. Thank you for sharing your beautiful story Clare. That is an amazing realisation and goal. Enjoy your month. Early on I found an author that really helped me – Louise Hay. Maybe check her site out if it seems right.